You can already buy this product which is officially "debuting" at CES. A Savile Row suit can make anyone look like a million bucks—but only if it’s tailored appropriately. And so it goes for the Neonode AirBar, a surprisingly good peripheral that adds “touch” capability to an ordinary laptop or monitor, provided you buy the correctly sized AirBar. Neonode’s AirBar certainly sounds like a steal: The slender sensor wand attaches to a laptop screen or standalone monitor, very much like Tobii’s line of eye trackers. Typically, native touch capabilities add about $100 or so to the cost of a new monitor, with no way to retrofit an existing touch-less device. Until now. The AirBar, which began shipping this week, is priced right at just $69. This unique gizmo is also a recipient of the Innovations Award for CES 2017, though it was first announced a year ago. The AirBar works by bouncing infrared light off your fingers, interpolating where your fingers touch the surface of the screen. 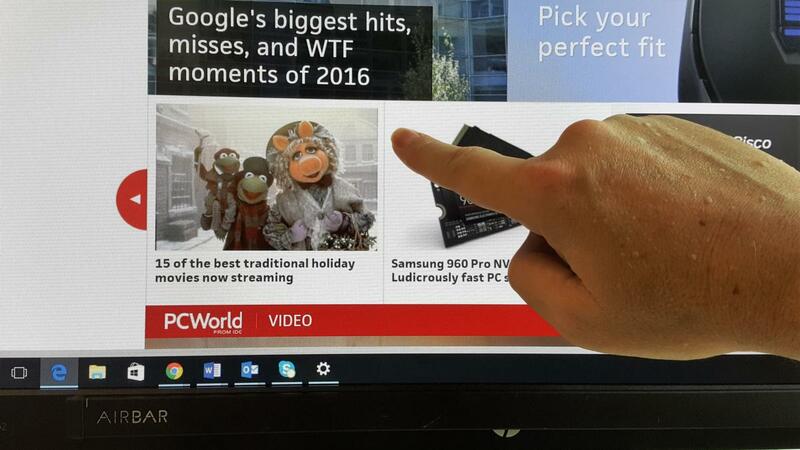 Make no mistake: A genuine touchscreen is more precise and offers more flexibility in terms of multitouch capabilities. 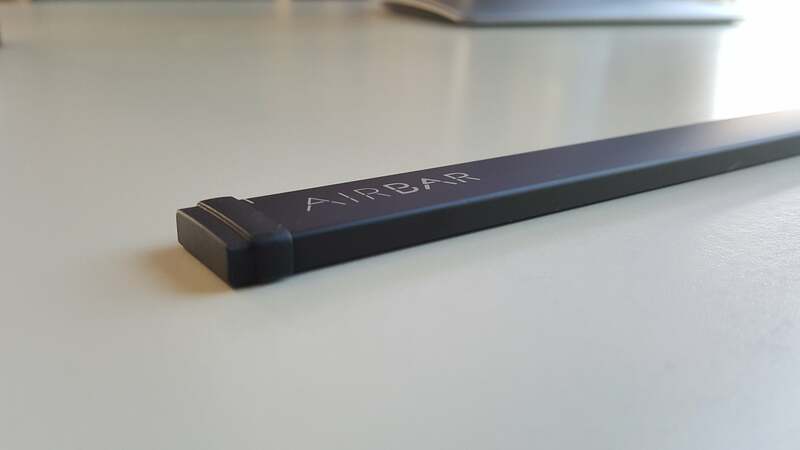 But for those who want an inexpensive-but-serviceable alternative, the AirBar does the job. If you have a suitably sized monitor (in this case, 15.6 inches wide, which is a little small for an external monitor), the AirBar can add touch capabilities. Neonode blithely promises an Apple-esque level of simplicity: “Attach. Plug in. Touch,” the box copy says. No need to even download drivers! 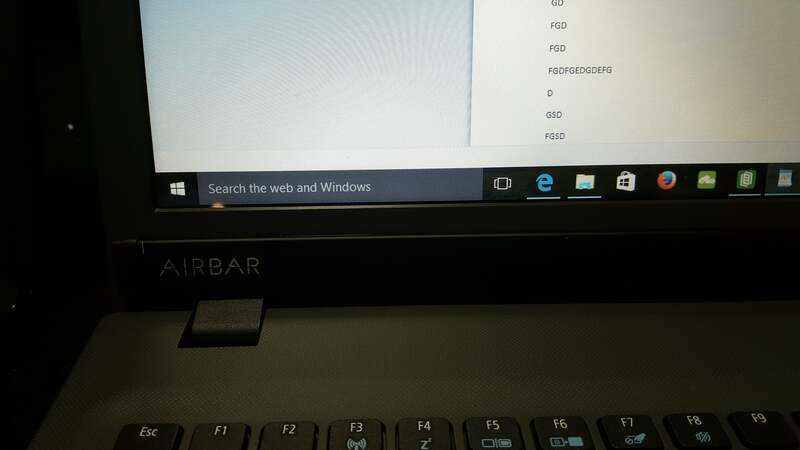 The AirBar works on both Windows 8 and Windows 10 machines, as well as Chromebooks. Sticky-backed magnetic couplings attach to your monitor and hold the AirBar in place. It’s worth noting that while you can probably use the AirBar with a computer monitor, the company’s packaging tacitly encourages you to use it with an older notebook that lacks a touchscreen. Frankly, I see this as a far more useful peripheral for the vast majority of computer monitors that lack touch capabilities, but there you go. And, as I discovered, the differences between using it with a monitor and a laptop are like night and day. Note that your laptop’s bezel must be about 0.67 inches wide to mount the AirBar, and since the AirBar is about 0.2 inches thick, you won’t want to close your laptop with the AirBar still mounted inside of it. (Crunch!) Also—and this is critical—be sure to match the length of the AirBar to your display size. Neonode ships three different versions, at 15.6 inches, 14.0 inches, and 13.3 inches, for 16:9 displays at those widths. As this picture shows, the AirBar’s USB cord is a bit too short. One of the AirBar’s big drawbacks, however, is its 9-inch USB cord—long enough to reach from a laptop screen to a USB port on the side of the notebook (provided your laptop has USB ports on the right-hand side), but too short to reach from a desktop monitor to that same laptop. I tested the AirBar two ways: first by mounting the device to a (non-touch) desktop monitor connected to a Microsoft Surface Pro 4. Then later testing the AirBar with a varity of laptops in stock at my local computer retailer (with the store manager’s permission, natch). Because the AirBar uses light to detect your touches, Neonode promises a degree of flexibility: You can use your fingers, or a gloved hand, or even a paintbrush. Only two touch points are supported, so we’re talking broad-strokes sensitivity. With a true touchscreen, it really doesn’t matter where you position your fingers—as long as they’re touching the screen, you can really hold your hand almost however you want. With the AirBar, it does matter, with emphatic pointing toward the screen producing the best effect. Using my 21-inch monitor in conjunction with the 15.6-inch AirBar, the AirBar’s touch point was way off. With an appropriately sized display, the accuracy was about a centimeter or less. If you’re accustomed to swiping a touchscreen up and down to scroll through a webpage, as I am, then the AirBar works fairly well. Steve Jobs warned about users developing “gorilla arms” from using a desktop touchscreen, but being able to swipe up and down is a nice convenience for when you choose to use it. In my tests I discovered that the AirBar’s precision is greatly dependent on how closely the AirBar’s size matches your display’s. I tested the 15.6-inch AirBar on a 21-inch display, where a sizable portion of real estate was not tracked by the wand. On my monitor, the “touch point,” visible as a small circle or dot, was consistently about an inch or so above my finger. 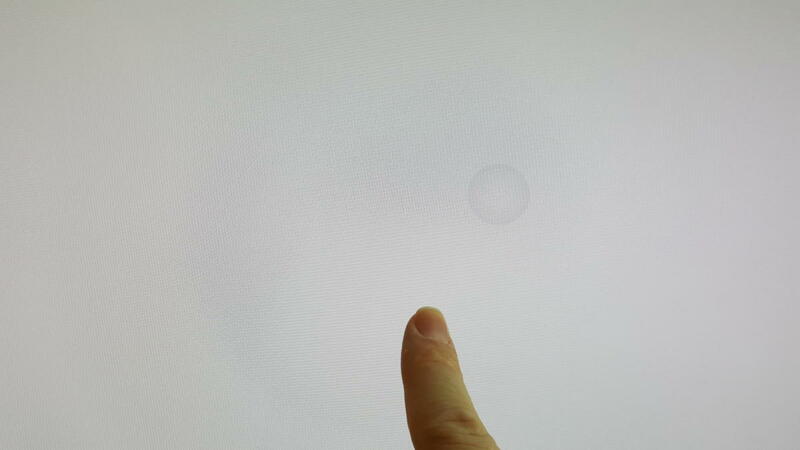 Navigating to a specific spot on the screen was impossible, though pinch-to-zoom gestures worked. Swiping, such as it was, felt like painting a fence—just flopping the screen around with broad, imprecise strokes. Matching up the AirBar to the correct display works wonders. I needed more data. Without a bunch of older, non-touch hardware at my disposal (such is the life a PCWorld.com reviewer), I headed off to an iconic Bay Area computer retailer. With the okay of the computer department’s manager, I was able to test the AirBar with handful of the store’s 15.6-inch laptops that lacked touchscreens. 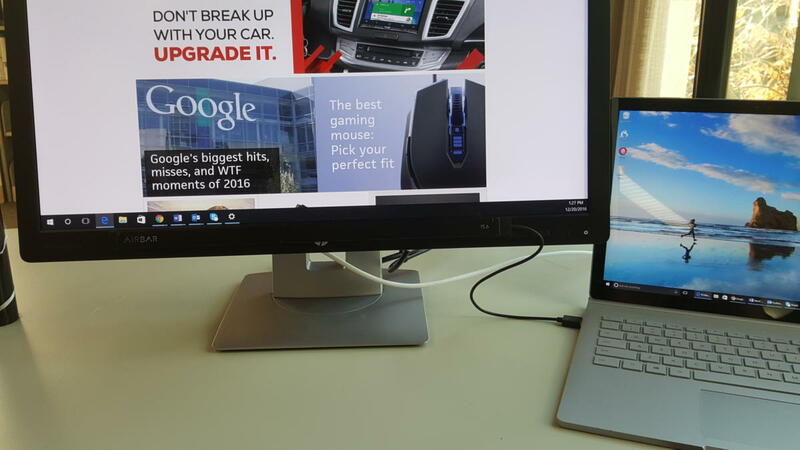 What a difference it made to match a true 15.6-inch screen with the same-sized AirBar! Suddenly I could swipe and pinch with relative ease. The AirBar registered touches a centimeter or two above my touch, but by doing so consistently, I was able to target my touch with an acceptable degree of accuracy. I suspect the AirBar is shooting light toward my fingers at set angles, and making assumptions about the screen to calculate the placement of my fingers. It does the job, but I’d like to see Neonode calibrate its device in the manner Tobii does, asking users to tap points on the screen for more precise orientation. 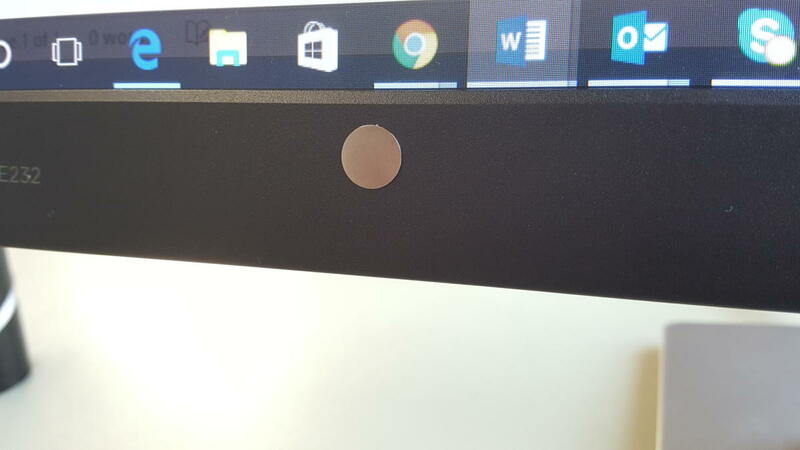 The AirBar is relatively thin, and fairly unobtrusive. I’m a bit more forgiving of the AirBar than I was of the Tobii eye trackers. You’ve got to give props for the mere fact that AirBar is adding serviceable functionality to older (or budget) hardware for a very reasonable $69. The AirBar is hampered somewhat by its uncompromising sizing—if your monitor doesn’t match up to the available lengths, your experience won’t be that hot. It’s not a viable option for desktop monitors, either. 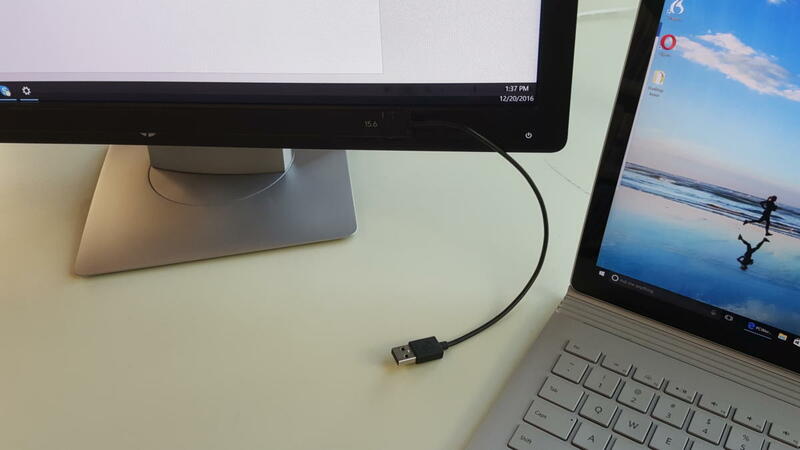 Even a 15.6-inch desktop monitor (as if) would be challenged by the short USB cable that connects the AirBar to a PC. But we are hopeful that Neonode will expand its lineup to cover many more screen sizes. “Man, I heard that thing was awesome,” gushed one of techs at the store where I tested. I wouldn’t go quite that far, but this is one of the more auspicious debuts of a new peripheral that I’ve seen in some time. Neonode's AirBar is an intriguing, inexpensive USB peripheral that transforms an older non-touch display into a "touchscreen".